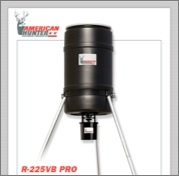 225 LB R-225PROVB Deer Feeder. heavy-duty poly barrel and is powered by an R-Kit Pro VB analog timer that feeds 1 to 24 times a day and allows feed rate control. Requires a 6 volt springtop, lantern-style battery (not included).